Yingling’s was proud to be the sponsor for KTPK’s Change Bandit Challenge to raise money for Children’s Miracle Network. For the third consecutive year, Yingling’s was proud to be the sponsor for KTPK’s Change Bandit Challenge to raise money for Children’s Miracle Network. 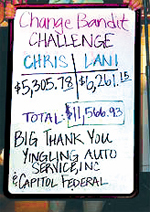 August marked Yingling’s second year sponsoring Country Legends 106.9FM’s Change Bandit Challenge. An event that raises money for the Children’s Miracle Network, the goal was to “rob” friends, family and coworkers of their loose change, and use it to help children in northeast Kansas get the life-saving care and services they need. DJs Chris Fisher and Lani Novak pulled out all the stops to see who could dig deeper. Donations poured in over the air, and on the station’s website. 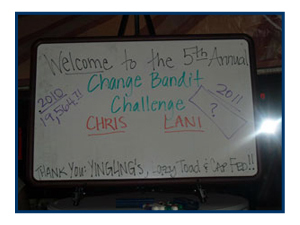 As a sponsor, Yingling’s had the honor of attending the Change Bandit Bash, an excitingwrap-up party where the proceeds were counted. The total? Over $19,000—about $7,000 more than in 2009. Of course, the true measure of success is every child’s life that will change for the better. Yingling’s is sponsoring Country Legends 106.9 FM’s Change Bandit Challenge, and we want you to join in on the fun and giving, too! The Change Bandit Challenge raises money for the Children’s Miracle Network through St. Francis Health Center. 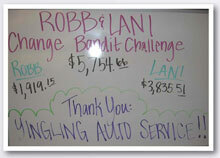 To be a Change Bandit, “rob” your friends, family and coworkers of their loose change. At the end of the challenge, the coins you’ve liberated from your pals’ pockets will go toward supporting the life-saving care and services the Children’s Miracle Network provides for kids in need. Official Change Bandit kits will be available through the radio station, but Yingling’s will have two change collection jars at our shop in August for everyone else. One will be supporting Chris’s team and the other will be supporting Lani’s team. Stop by and show your support!